This global nonprofit shares its journey from legacy infrastructure to its RingCentral Office deployment and lessons learned along the way. Randy Boyd, infrastructure architect at World Vision U.S., has some interesting experiences to share relative to a cloud communications migration he's overseen at this global humanitarian nonprofit. But as he relates those, he wants to be clear about one thing: He's not a telephony guy. Rather, as I learned in a recent interview, he's a server and storage guy... by engineering background and in the responsibilities he's held in a 30-year IT career that has included stints at companies like Boeing, Safeco Insurance, Liberty Mutual, and Starbucks. Of coming to World Vision two and a half years ago, he noted, "I didn't take a telephony job. I came as an overall infrastructure architect with an eye toward a lot of aging systems." Boyd characterized the technology infrastructure upgrades needed at World Vision upon his arrival as having that "once every 15- to 20-year flood nature" -- major upgrades, big redesigns. Since those early days, World Vision has updated its storage infrastructure, for example, and migrated from MPLS to all Internet for wide-area networking. Yet overhauling World Vision's telephony system, in Boyd's estimate, is "far and away the largest task" he's undertaken at the organization. The scope, touching 1,100 users in 12 locations, qualifies it as such, he added. Done well, storage and networking changes are minimally, if at all, invasive to the user population. However, the same can't be said of telephony, as an end-user service. Transitioning from one system to the next requires lots of training and establishing a baseline understanding of new features and capabilities. "At the same time, [users] had to know that if all they wanted was dial tone and voicemail, that was going to be an incredibly easy transition for them," he said. As Boyd learned about how World Vision had been delivering such services at the time, he began realizing the problems associated with having outdated phone systems. They offered only limited feature sets, and were difficult to manage and expensive to maintain, he said. For voice, the company maintained PBXs at each of its locations. Old Nortel Business Communication Manager (BMC) platforms served smaller sites, for example. As you might imagine, when those failed -- which Boyd said was happening with increasing frequency -- World Vision could only purchase parts for them on the used market. "So that added urgency to the scenario," he said. 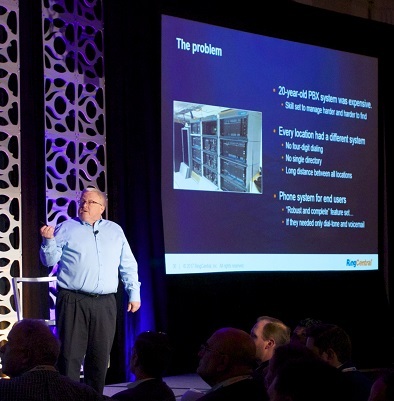 As Boyd examined the network design and started doing the math on all the PRI circuits the telephony infrastructure entailed, there came a "growing awareness of ... what our phone system alone was costing us," he said. With the CIO's blessing, Boyd set upon the task of discovering just how much World Vision was spending on that aged hardware and those outdated circuits on a per-user, per-month basis -- "north of $50 a month per user." With this figure, they could then match the company's spending to modern, non-premises-based telephony pricing. The savings potential was an eye-opener. "Once we understood that, that's what took our project from a five-year history of, 'Boy it'd be nice if we ungraded our phone system' and 'Yeah, we really should do that' ... to get prioritized to the very top of the infrastructure list based on how much money that was going to save us," Boyd said. "Anybody who goes out and looks at any of the cloud-based offerings will quickly see that you can land pretty easily in the $25-to-$30 per-month range. ... That was just a drastic opportunity," Boyd said. "Not only that, the reality is that we were fundamentally only providing dial tone and voicemail for that price point." Also factoring into Boyd's spending analysis were some classic command line-driven automatic call distributors for which the company had to hire out consultants to manage (in some cases), as well as outlays for interoffice long-distance, audio conferencing, and Web conferencing services, he said. "All of these were part of my cost justification because we were shopping for a solution to replace all of it." While World Vision opted to transition from its legacy on-premises system to a cloud telephony platform from RingCentral, that choice wasn't a given, Boyd said. "I wish I could tell you that a year and a half ago, that I was smart enough to know that voice in the cloud was robust and reliable, but I really wasn't. So it was not the only thing on our mind." That said, World Vision had been "absolutely inclined" toward cloud. The CIO has been a longtime proponent of a cloud-first model, which suits the company from a "freedom of resourcing" standpoint. Boyd explained: "We're a nonprofit. In the Seattle area we're in a hot technical market, so it's sometimes hard for us to keep good technical people. We're always looking for opportunities to lower the amount of technical complexity we have to manage and maintain." World Vision started its telephony upgrade project with 12 options, including a handful of cloud services, some hosted offerings, a managed PBX potential, and even an on-premises PBX, Boyd said. A fine-tuning got the list down to six, with all but the cloud and hosted options eliminated. From there the company landed on a single hosted option and one cloud service, and ultimately signed on with RingCentral. The RingCentral Office services portfolio factored heavily into the decision, as did voice quality, software quality, uptime reliability, and, "then, obviously, cost mattered a bunch as well," Boyd said. Also important was making sure RingCentral's long-term vision aligned with World Vision's strategy, he added. World Vision is just past the one-year mark as a RingCentral Office customer, heavily reliant on its telephony services as well as, in an unforeseen way, the meetings capabilities, Boyd said. "Honestly," he admitted, "we didn't really promote RingCentral meetings, but that's something our users have found -- I mean, we told them about it -- and showed them how to use it lightly, but we didn't really push it. But utilization is through the roof on RingCentral meetings, in terms of our user community." Virtually all meetings -- 98% of them -- just need good quality voice, video, and screen sharing with fewer than 20 people, Boyd said. "Turns out RingCentral meetings makes it very easy to do these things, and our users have taken it and run with it." Continue to next page and read about the "biggest nightmare you'll ever experience"